Application and removal are more easily facilitated since compression is divided between two layers. The fabric on the Overstocking has been specifically designed to slide comfortably over the Understocking. The advanced Multi-Layer Stocking provides accurate compression, proven healing performance, superior patient compliance and allows the patient to take part in the application of their own compression therapy. The Multi-Layer Stocking System is not intended to be a replacement for conventional compression wraps but rather should be used as a transition to healing.After edema has been stabilized, the Multi-Layer Stockings should be prescribed so that patients may begin to take part in the application of their own compression therapy. be affective for the life of the garment and unaffected by washing and drying. In under 24 hours laboratory testing of copper oxide in the fabric reduced bacteria and fungus. 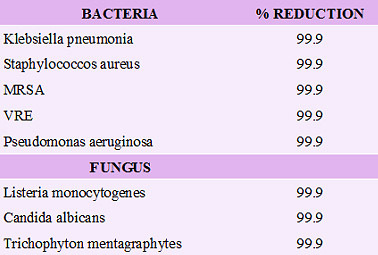 Source: AATCC test method 100 - 2004 antibacterial finishes on textile materials.